Klairs focuses on providing simple minimalist eco-friendly, green, basic, products and they do not partake in any animal testing. They really just include the ingredients that need to be in the products without anything else! Klairs Freshly Juiced Vitamin Drop ~ $23.00 US. The Klairs Freshly Juiced Vitamin Drop is a serum to rejuvenate the skin. It contains concentrated pure vitamin C and key ingredients directly from nature. Its innovative multi-solution and non-irritating formula is to revitalize, maintain, and transform the skin. This is a Vitamin C serum is meant to target skin tone and texture - it targets hyperpigmentation and acne scars. It is non-irritating and safe for acne-prone skin. I'm not going to lie, I was really nervous about using a Vitamin C serum - I have only used one in the past and I found it didn't work for my skin and it really broke me out. But, I was willing to give Vitamin C a try again and I have to say that I'm really happy I tried this out - it has worked amazing on my skin and I think it delivers on all the results it promises! This serum is a combination of Vitamin C, Centella Asiatica, Yuzu Extract, and Broccoli Extract. Use this serum where you would use your normal serum - I wash my face, tone my skin, apply a mist, and then apply my serum. Then I follow up with my moisturizer. To apply, simply drop 1-2 drops in your palms and massage in to your face with palms. If your skin is especially sensitive, apply with your favorite serum or mix with your moisturizer. I personally use this once per day at bedtime! Since I was concerned about my sensitivity to Vitamin C prior, I did start by using this mixed in with my moisturizer and then my serum just to ease myself in to using it. After a few days I have been applying directly on the skin and there have been no reactions. I often combine serums, so I use this alone or mixed with another serum and it's good both ways! 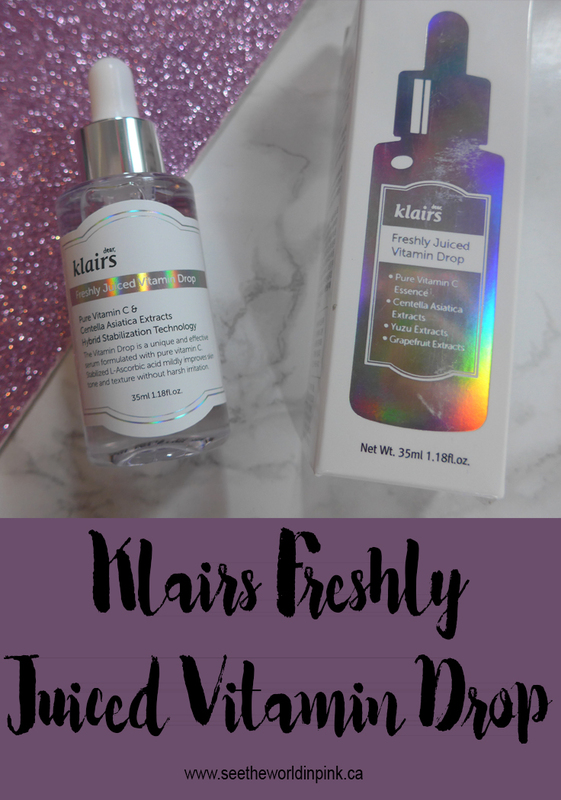 I really like the Klairs Freshly Juiced Vitamin Drop - I'm really impressed with how this has worked for my skin! This has been amazing for my skin - I have only been using this for 2.5 weeks and I can see visible results! My skin tone is much more even overall and my acne scars have gone down. My skin is looking really refreshed and clear! Also, my skin has been very clear since I have been getting no breakouts and my skin using this daily! And, this was my first cycle that I did not get any hormonal acne breakouts and I'm feeling pretty fantastic about that! (I'm going to wait for next month to 100% give credit to this product, but it's pretty clear this a big help in that). This is also the first time in a long time that I was able to wear only a tinted moisturizer to work instead of a foundation and thats a big step! I will absolutely keep using this - in a short time it has become a staple in my routine! Have you tried a Vitamin C serum before? I'm currently using this one too, but it's too soon to tell if it's doing anything yet. I'll have my review up next Thursday (cause, deadline) so we'll see. Oooh - I really noticed the results, especially in the breakout department. I wish it could have been a little longer test time!